Enzymes are secreted that degrade macromolecules outside of the cell.The resulting small molecules are transported into the cell. Macromolecules are brought into the cell by pinocytosis or, in the case of protozoa and phagocytes, phagocytosis. 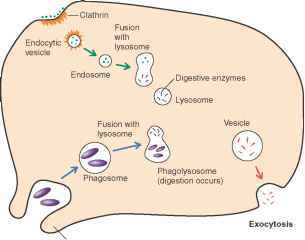 Lysosomes carry digestive enzymes. Generally involves flagella, which are composed of protein subunits. Flagella rotate like propellers, using proton motive force for energy. Involves cilia and flagella, which are made up of a 9 + 2 arrangement of microtubules. 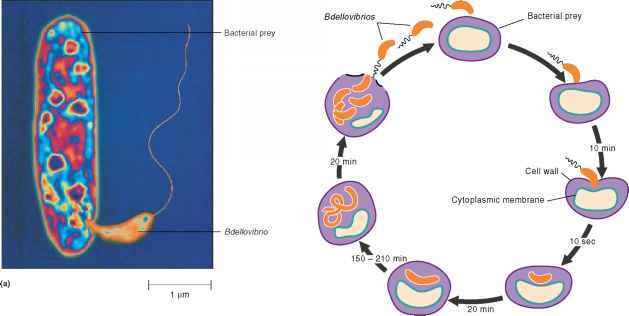 Cilia move in synchrony; flagella propel a cell with a whiplike motion or thrash back and forth to pull a cell forward. 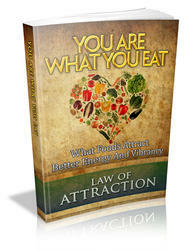 Both use ATP for energy. A characteristic signal sequence marks proteins for secretion by the general secretory pathway.The precise mechanisms of translocation are still poorly understood. Secreted proteins are translocated to the lumen of the rough endoplasmic reticulum as they are being synthesized. From there, they are transported to the Golgi apparatus for processing and packaging. Cytoskeleton composed of microtubules, intermediate filaments, and microfilaments. Some have a cell wall; some have sterols in the membrane. Primarily active transport; mechanisms include major facilitator superfamily and ABC transport. Group translocation. Facilitated diffusion and active transport; mechanisms include major facilitator superfamily and ABC transport. Ion channels. Endocytosis is the process by which eukaryotic cells take material from the surrounding environment. They do this by enclosing those materials in a fluid-filled compartment (figure 3.50). The type of endocytosis common to most animal cells is pinocytosis. In this process a cell internalizes and pinches off small pieces of its own membrane, bringing along a small volume of liquid and any material attached to the membrane. This endocytic vesicle becomes a membrane-enclosed, low-pH compartment called an endosome. This then fuses with a digestive organelle called a lysosome. The characteristics of lyso-somes will be discussed shortly. Figure 3.50 Endocytosis and Exocytosis Endocytosis includes pinocytosis (receptor-mediated endocytosis) and phagocytosis. The process of exocytosis is the opposite of endocytosis. Membrane-bound vesicles inside the cell fuse with the plasma membrane and release their contents into the external medium. The processes of endocytosis and exocytosis result in the exchange of material between the inside and outside of the cell. across a membrane. Ribosomes synthesizing a protein that will be secreted attach to the membrane of the endoplasmic retic-ulum (ER). The characteristics of this organelle will be described shortly. As the protein is being made, it is threaded through the membrane and into the lumen of the ER. The lumen of any organelle can be viewed as equivalent to an extracellular space. Once a protein or any substance is there, it can readily be transported by vesicles to the lumen of another organelle, or to the exterior of the cell.